Fiction – paperback; Hesperus Press; 288 pages; 2013. Translated from the Swedish by Ellen Flynn. Review copy courtesy of the publisher. 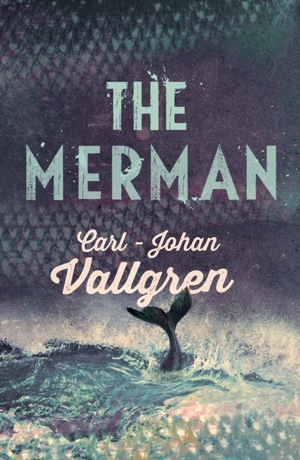 Carl-Johan Vallgren’s The Merman wins the award for the most unusual book I’ve read all year. It’s a mesmerising and slightly surreal tale involving two misfit children and, as the title might suggest, a creature known as a “merman”. The story, which spans October 1983 to May 1984, is set in a small town on the west coast of Sweden. Here, 14-year-old Petronella (known as Nella) and her 12-year-old brother, Robert, live a fairly difficult life. Their mother spends her days in an alcoholic stupor and their father, who has been in jail for the past year, is too caught up in his criminal life to do much to help his children. Often there is not enough money for food, so Nella and Robert must fend for themselves. Often Nella resorts to shoplifting to get by. To make matters worse, Robert has learning difficulties and is bullied at school. Nella does her best to protect him, but finds herself caught up in a vicious cycle in which she must pay off his tormentors or be bullied herself. But there are two good things in Nella’s life: her friendship with the Professor, a local man “who hobbled his way through life on crutches paid for by the health service and read everything he could read and collected everything he could collect” and with Tommy, a boy her own age whom she has known her whole life. When she asks Tommy for help, she can’t help but notice strange events going on in his family’s dilapidated boat house and this leads to a startling discovery. The blurb on the back of my uncorrected proof goes to great lengths to avoid mentioning what lies hidden in the boat house, but when you call a book The Merman I don’t think there’s much point trying to be coy. There’s a strange creature chained to the floor — half fish, half mammal — which Nella describes as a “sea ape”. It’s only later, with the help of the Professor’s research, that she believes it to be a merman. It turns out that the merman is being subjected to terrible abuse, mirroring in some way Nella and Robert’s experiences in the hands of the school bullies and their own parents, and his existence is being kept secret from the authorities. Much of the story is about Nella’s endeavours to save the merman from further mistreatment — something she, too, must do in secret — while seemingly ignoring her own personal problems, which are worsening. As well as being an excellent portrayal of what it is to be an outsider, the book is very good at describing life in a small town and the oppressive nature of life at secondary school. It’s quite a lovely story, if violent and distressing in places, and has a strong moral message at its core about cruelty and compassion. But it’s a little clunky in places, with a little too much emphasis on explaining things and spelling them out, rather than letting the reader figure things out for themselves. And while the characters of Robert and Nella are richly drawn, many of the other characters, especially the school bully Gerard, are little more than caricatures. The story, however, flows well and is easy to read — indeed, it slipped down a treat on Boxing Day when I was feeling poorly with a chest cold and was tucked up on the sofa — and it’s sufficiently poignant to provide a feel-good factor when you reach the final pages. In many ways it’s like reading a fairy story, but one that’s designed for adults — perfect, if you like that sort of thing.